41 professionals from a diversity of cultures & professions - from architects, businessmen and interior designers to IT specialists, advertising specialists and financial controllers - made up the May 2005 batch of Master Practitioners Course students. They came from Belgium, Brunei, Canada, California, China, Croatia, England, Hong Kong, Indonesia, Malaysia, Mauritius, Nepal, Philippines, Portugal, Romania, Singapore, Thailand, USA and Vietnam. There were also two pairs of husband and wife teams, as well as two Buddhist nuns! Throughout the one-week course there was great camaraderie, where students helped each other during the course by sharing ideas, brainstorming, and working in groups in the competition case study to win the class prize. The course is always chock-a-block full of activities from day one, with Lillian teaching the entire course personally with great panache and style. Said one student, "Lillian shares her feng shui knowledge with great passion and this course has certainly cleared any qualms and it's really fun learning feng shui." While another student said, "This has been an amazing trip to Malaysia meeting a great bunch of wonderful people. I am definitely looking forward to the next advanced class." There we some beginners who worried they might not know enough to catch up with the rest of the class, but by week's end, those worries were gone, as Lillian made the course as valuable for the seasoned practitioner as it was enlightening for those new to the science. By the time they had to tackle the case study competition, everyone was plotting natal charts with confidence and adept at using the feng shui Luo Pan. The MPC course is structured to give each student a firm foundation in the various schools of feng shui, to a level where they can confidently plan their own feng shui or carry out consultations for clients. They can then use feng shui as a tool to enhance their business luck, family relations, to find love, to recover from bad energy in terms of health, wealth or safety, or use it to plan their investments, buying or selling property or helping others. Lillian's sense of humour, sensitivity and endless stream of anecdotes and stories to begin the class daily made the sessions not just informative but entertaining as well. The one-week class included morning lectures specially designed to coax maximum absorption by the students, interspersed with laughter and case examples. While afternoon sessions were either classroom lectures, class discussion or site visits. They learned how to use the Luo Pan, the Feng Shui compass, both in the classroom as well as outside of it. Students were also taught the method of space clearing to uplift the energy within any given space. The week ended on Saturday, culminating in the graduation party. Apart from plenty of wining, dining and the presentation of certificates, the winners of the Competition Case Study were announced. One of student shared her endearing and uplifting story after Lillian introduced the class to 9-eyes Dzi. Dawn Gibbins MBE from the UK mentioned the bracelet has amazingly brought her good news that her company has signed up a big project when she has prayed hard to get the contract. Another student, Anthony, says the two-eyed Dzi has done tremendous things for his love life. The course program found favor with every member of the class, from the lectures to the case studies, from the site visits and outings to the syllabus covered. 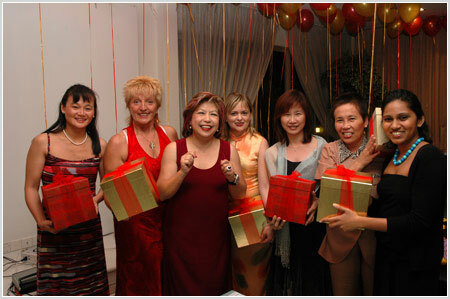 Many had planned to come back to Malaysia for the next upcoming advanced course, the Master Consultants Course in July 2005, where Lillian will go even deeper into the various formulas of feng shui, as well as use more practical and difficult examples. She is also offering a Master Class in Paht Chee (or Four Pillars) scheduled for September this year. Thank you so much for your help and kindness. I am so grateful to you Lillian, my teacher, for coming into my life. This has been an amazing trip! Not only have I traveled all the way from Virginia, USA, I have met many wonderful people & absorbed your knowledge of feng shui. I can't wait to go back home and start doing the analysis and the cures. Thank you very much for sharing your knowledge of Feng Shui. I have always been interested in Feng Shui and I think it is my good karma that I have this opportunity to be here under such a great master like you. I hope to be able to share what I have learnt with my family and friends. Many thanks to you Lillian! Finally I managed to attend your course, must be all the light offering practice I have done this year! Your devotion to your Lama, your kindness, and your fantastic humour are truly inspiring. May you continue teaching and may your life be very very long! I'm hooked! All the best wishes for you and your family & wonderful staff! Thank you very much for organizing this course. After attending for the 3rd day, most things are becoming clear and it's really fun learning in this class. You've been an inspiration to me! 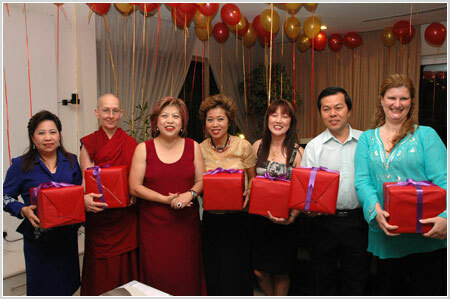 Thank you for sharing your vast knowledge of feng shui and live experiences with us. You've been very kind to my family too and I want to thank you for everything - especially moving my Chinese bed! May you always be blessed with everything you wish for! 1st Prize went to Group E, comprising Grob Helena, Rose Marie S Ang, Marinneth T Ngo, Dawn Gibbins MBE, Shoba Haridas and Carmencita S Marfe. Linda Gouw Juat Lie and Chin Ng. 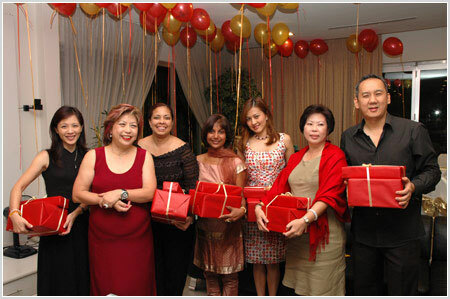 3rd Prize went to Group B, comprising of Gloria Lizette Tapia, Meera Sen, Joseleen Goh Hui Yee, Ismail Djaliman, Theresa Yeo and Sunassee Vijayal.